Evangelism is a topic which generates a variety of opinions among Reformed believers. On one side there are many who are passionate about evangelism. They are often disappointed, sometimes even frustrated, because they perceive that Reformed churches are too inward looking and too passive in fulfilling their evangelistic calling. On the other side there are many who are reluctant about evangelism. They fear that an emphasis on evangelism will cause the church to become more ‘evangelical’ and less Reformed. They point to churches which are active in evangelism but Arminian in theology. There is no doubt that both sides mean well and have valuable points to make. It is true that Reformed churches by and large do not have a strong performance record in terms of evangelism. On the other hand, it is also true that there is much outreach activity that does not reflect the full truth of the gospel. There is reason to be cautious. In my opinion Reformed churches can be more effective and faithful in their evangelistic ministry without having to sacrifice anything in terms of Reformed identity. I am convinced that investing more time and effort in evangelistic ministry will strengthen the church, provided it is done in a Biblical way. In a series of three articles I would like to make some suggestions with respect to the ministry of evangelism: (1) its Biblical basis, (2) the approach to evangelism which we have inherited from the Reformed tradition, (3) and the practice of evangelism. In order for us to get a Biblical perspective on evangelism we have to start in the Old Testament. It is important to recognize that the people of Israel were set apart by the Lord to be a holy people and at the same time to be a light and a blessing to the nations around them. A foundational passage is Genesis 12:1-3 which tells us about the calling of Abraham. The Lord called him to leave his country, his people and his father’s household and to go to the land the Lord would show him. The Lord promised Abraham that He would make him into a great nation, that He would bless him and that Abraham would be a blessing. The promise ends with these words: “… and all peoples on earth will be blessed through you.” (Gen. 12:3) We know that this blessing would ultimately be fulfilled in the coming of the Messiah. In Him the nations were to be blessed. This is a theme that is found throughout the Old Testament: the expectation of the Messiah who would come to restore God’s people and to whom the nations would come to receive salvation and an abundance of blessings. But the fulfillment of this promise was not restricted to the work of the Messiah. Israel itself was intended and called to be a blessing to the nations. Israel was called to be a kingdom of priests, a holy nation (Ex. 19:6), set apart for the Lord, and at the same time called to proclaim the glory of God to the nations around them. Throughout the Old Testament we read about the desire that other nations would acknowledge that Israel’s God is the only true God, good and merciful. We read about the young Israelite girl who was taken captive to the land of Aram and who told her mistress that there was a man of God in Samaria. We read how this led to the mighty commander Naaman coming to Israel and eventually confessing “that there is no God in all the world except in Israel” (2 Kings 5:15). More passages from the Old Testament could be quoted, but we see an emerging pattern: In the first place, Israel is God’s special people, his chosen nation. He dwells among them and they experience his blessings. In the second place, Israel is intended to be a blessing to the nations around them. God’s people (should) have an intense desire that the nations would be able to see that life in the covenant is good, and that there will be a future during which the nations will come and join God’s people to declare God’s praises. The apostles went forth and proclaimed the gospel of Jesus Christ who was crucified and risen from the dead. Beginning from Jerusalem, they moved to Judea and Samaria and then other areas, calling everyone to repent and have faith in the Lord Jesus Christ. People from different cultural and national backgrounds were incorporated into the church of Christ: Jews and Samaritans, Greeks and Romans, blacks and whites. God’s people are recruited from all nations in the world. The new covenant differs from the old covenant in many ways. But some things have not changed at all. Believers are still aliens and strangers in the world. They are still called out of the world to be a holy nation, yet they are called to live in the world as a blessing and a light to the people around them. The original calling of Abraham still applies today! The first epistle of Peter also speaks eloquently about the calling of Christians to be a light to the people around. The apostle addresses Christians as “strangers in the world” (1:1) who have been “chosen” and called out of the world (1:2). At the same time he emphasizes their calling in the world: “You are a chosen people, a royal priesthood, a holy nation, a people belonging to God, that you may declare the praises of him who called you out of darkness into his wonderful light.” (2:9) Peter emphasizes both the ‘called-out’ aspect and the ‘be-a-blessing’ aspect of the Christian life. We may draw the conclusion that a consistent picture emerges from both the Old and the New Testament: God’s people are a chosen people, called out of the world, called to live a holy life that (by the grace of God) will be instrumental in winning over others to repent and join God’s people. While Christians are citizens of another Kingdom, they are called to be a blessing to others in this world so that many more people would find salvation in the Lord Jesus Christ. A balanced approach is needed. The church is called out of the world but the church is also called to let its light shine into the world. Sometimes the ‘separation-from-the-world’ aspect is emphasized so strongly that the church lives in isolation from the broader society. The social network of believers is limited to the church network. Having contacts with un-churched people is frowned upon and considered to be dangerous. This is not what the Bible teaches us. The apostle Paul assumes that believers have all kinds of contacts with outsiders. He does not exhort believers to avoid contact with unbelievers. He simply assumes that they have such contacts and he encourages them to “be wise in the way you act toward outsiders, making the most of every opportunity.” (Col. 4:5). In the light of these considerations we may conclude that evangelism is one of the ministries which the Lord has given to his church. Every part of this statement is important: Evangelism is a ministry given by the Lord (therefore we may not neglect it). It is a ministry given to the church (therefore the whole church is responsible). And it is one of the ministries which the Lord has given to the church (not the only one). The church has received a variety of ministries from the Lord: preaching, teaching, worship, pastoral supervision, diaconal help, and the spreading of the gospel in the world (mission and evangelism). 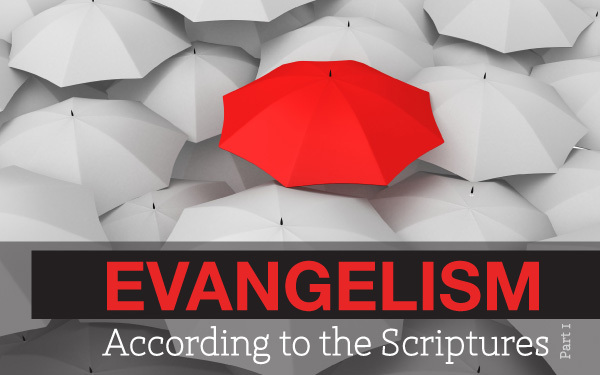 There is no doubt, then, that evangelism is an important calling of the church. Every local congregation should examine itself whether it is faithful in this calling. And the Canadian Reformed Churches should examine themselves whether – as a federation – we are diligent and faithful in proclaiming the gospel to our fellow citizens in this country. In the next article I hope to say more about the approach to evangelism which we have inherited from previous generations.